The SB2C Helldiver was developed as the intended replacement for the SBD Dauntless, continuing a long line of dive-bombers of the U.S. Navy. While the SBD was a good design for its time, the Navy Bureau of Aeronautics felt that speed, range and bomb load could all be improved. The resulting design from Curtiss valiantly tried to meet the design requirements and Navy size restrictions, which resulted in a large, short coupled, heavy machine with a new larger engine. After a prolonged development period, the Helldiver did reach production and front line usage in mid-1944 but the crews never loved the design. It had many nicknames but was usually just called the "Beast". In spite of its development problems and poor handling, and probably due to the great work of the pilots and ground crew, the airplane did contribute significantly to the war effort during the final year of the war. In fact, late models of the Helldiver performed better than most of the other aircraft in the Navy's inventory. Only the Corsair was significantly faster. 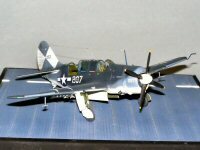 After the war, the SB2C was finally replaced by the excellent AD Skyraider. 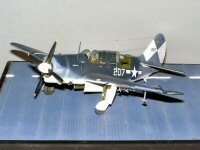 The Skyraider was not held to the same size restrictions as the Helldiver and therefore did not encounter the same problems. 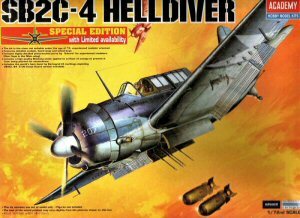 When Academy added the Helldiver to their line-up in 2005, it became the best model of the "Beast" in 1/72 scale. Kit content was superb with excellent detailing in the cockpit, rear gunner's area, bomb bay and wheel wells, along with finely engraved surface detail. Construction was reasonably easy and included integral wing spars to ensure a strong and accurate wing to fuselage joint. The flaps and dive brakes were molded flush with the wings with the perforation detail simulated into the surface. This Special Edition of the Helldiver from Academy includes new decals along with a special photo-etched sheet to accurately reproduce the detailed, perforated flaps and dive brakes of the Helldiver. The Special Edition also includes a very good die-cut sheet of adhesive tape masks for the different sections of the canopy and the wheels. Markings for three aircraft are included; a tri-color version from VB-83 of the USS Essex, an all sea blue bird from VB-84 of the USS Bunker Hill and finally a sea blue model with yellow trim from the US Coast Guard. Three good choices. Construction starts with the cockpit. The floor of the cockpit is molded integral with the top of the bomb bay providing good detail on both sides. I was pleased with the detail of the cockpit. The seat is nicely molded and appears to be accurate based on references. Separate sidewall panels add to the detail and provide sufficient depth of detailing to really jump out with some wash and highlighting. All I needed to add were some colored photo-etched seat belts from Eduard to finish it off. A decal is provided for the instrument panel but the plastic part is so well detailed that I felt that it would look better by painting - slightly lightened flat black for the panel and glossy black for the instruments with silver, red and white highlighting. 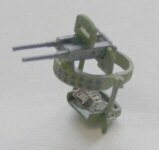 The rear gunner position featured similar detail with the machine gun mount consisting of six well-molded parts. The fuselage assembled easily. All of the parts of the cockpit, bomb bay and gunner's position fit perfectly when the fuselage was closed. I chose to wait until the final assembly phase to install the bomb bay doors. This allowed me to better paint the doors and to protect the painted detail within the bomb bay. I also chose to hold off on the assembly of the tail hook in order to avoid breaking the part during subsequent handling. The addition of the photo-etched parts for the flaps and dive brakes in this Special Edition kit requires the modeler to remove the appropriate areas at the rear of the upper and lower wing halves. The edges of the areas have nicely embossed lines so it is relatively easy to make these modifications. The modeler must make sure that these cuts are accurate and the edges finished so that the photo-etched parts will fit. I was worried about the wings loosing some rigidity as a result of these modifications so I glued some small spacers in place to ensure that the wing shape was rigid. The wings fit the fuselage surface well. The stub spars mated with the fuselage side and the bomb bay top surface to ensure a strong and well-aligned joint. 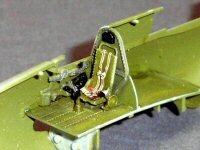 One thing to note - be sure to install the gun barrels, parts B9, in the wheel wells before joining the wings. I overlooked these parts and had a problem fitting them later. 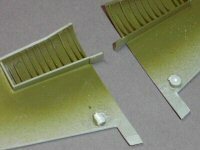 The photo-etched parts for the flaps and dive brakes are well designed. A single part folds into the dive brake top surface, the flap outer surface and the flap inner structure. Two other parts provide the interior structure of the dive brake. The latter parts need to be carefully glued in place to avoid filling the perforations in the brakes. I chose to paint these assemblies separate from the model and then attach them during final assembly. I painted the inside of the assembly insignia red and then masked the inside and painted the outer colors - sea blue on the top, white and intermediate blue on the underside. I wanted to be careful to not apply too much paint to maintain the perforations open. The aircraft carrier markings on the top of the right wing and bottom of the left wing extend onto the dive brakes. I ended up trimming the decal and painting the marking onto the top of the dive brake. Again, I did this to preserve the delicate detail of the photo-etched parts. Following assembly of the wing and stabilizers to the fuselage, I filled the cockpit, bomb bay and wheel wells with tissue and painted the model. I then applied Future, applied the decals, protected them with Future and applied a light oil paint wash. This was followed with a coat of clear dull acrylic paint. I know that some areas of the real airplane were gloss but I believe that in this scale, overall flat looks better. Call it scale effect. 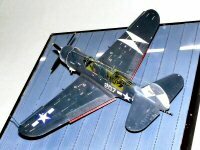 The kit decals offer black and white lettering for the aircraft. They state that white is for the sea blue areas. I have seen this lettering on overall sea blue aircraft but they are harder to note on three-color schemes. I used them anyway. They look good. I did, however, tone them down slightly with a very thin coat of sea blue. At this point, the dive brakes/flap assemblies were attached. The dive brakes could be displayed open or closed. I chose to display them with the upper surface closed and the flaps open. This is the configuration that would be most likely seen on the ground, plus I didn't have to add some small cylinders etc. to the assemblies. Once this was completed, some light salt spray weathering was applied. In addition to the photo-etched parts, the special edition kit offers a die cut tape mask for the wheels and canopy. I was very impressed with this material. The directions clearly explained which part went where and the parts fit the panes of the canopies very well. My only concern was the sliding canopy over the pilot, part C3. It appears that the lower sills are not wide enough. The red "enclosure release" decal will not fit. I ended up re-masking the area and painting a wider blue area for the sill, ignoring the lines for the glass. The decal covers this up fairly well. Incidentally, canopies were very thin and transparent. I coated them with Future before painting but this was not really necessary to improve clarity, I did it for protection. The Yagi antennas under the wings are delicately molded in plastic. They look OK, but they would have really benefited from being included on the photo-etched sheet. They are glued to the undersurfaces and are very fragile. The last two items added were the Pitot tube (mine broke when I tried to remove it from the sprue) and the tail hook. I had to trim the latter to fit it into place, but I am sure that I would have broken it several times if I had installed it when I closed the fuselage. Finally, I added the radio antenna. I prefer to use stainless wire for this purpose. I was pleased with this kit. It outclassed its competition when it was issued in 2005 and it has been improved with this Special Edition. It makes up into a very realistic reproduction of this famous (or infamous) WW II dive-bomber. The kit has a number of small and delicate parts but the fit is excellent. Panel lines are engraved and surface detail is not overdone. It is well recommended for all modelers with even limited experience. I would like to thank MRC for providing this great kit to IPMS/USA for review. Well recommended. 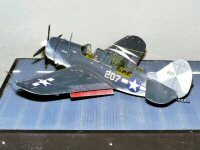 The following books provide excellent details of the Helldiver as an aid to the modeler. 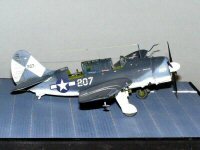 · SB2C Helldiver in Detail & Scale by Bert Kinzey. Volume 52 in the D & S series. · SB2C Helldiver in Action by Robert Stern. Number 54 in the series from Squadron Shop. · Curtiss SB2C Helldiver. Number 80 in the Famous Airplanes of the World series - June 1977.
are the intellectual property of IPMS/USA �.